CDR Technical Services now offer a full range of Pilot burners of which there are many variations which include hood types, mounting bracket types and electrode location, each has a unique Robertshaw part number stamped into the body, this determines the hood, body type and flame pattern. All pilots can be supplied with LP or Natural Gas Orifice Spuds (injectors) with various hole sizes to the customers specification. 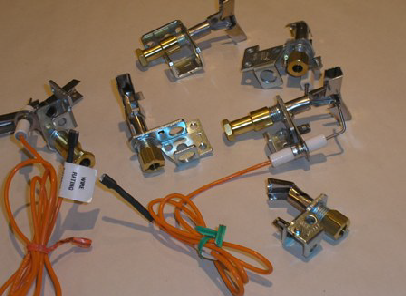 These models can also be supplied with permanently fitted electrodes which are riveted to the pilot body and the spark gap is fixed at 1/8”. Pipe tubing is 1/4” as standard. Typical Range of Pilot Burners. 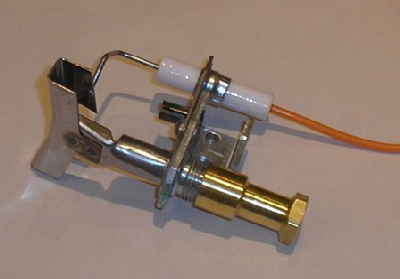 Pilot burners are often fitting with electrodes and fly leads for easier installation. Pilot assemblies are normally supplied with a hood canopy, Orifice injector (size to be specified for application) and the compression fitting lock nut and olive. However, each item can be purchased individually to suit customer requirements. For assistance in selecting the correct model for your application, please contact our technical department, who can offer advise and support.